Why the hat? Everyone knows the Scotty Dog’s the best piece! Combinations give the real advantage. My strategy is putting the hat on top of the car. What about the cannon? Or the battleship? Fun fact, Dana accidentally drew the second to last frame of this strip with Stephan and Timulty in the wrong order, so she used a computer to mirror image it. Let it not be said that she never catches continuity errors. 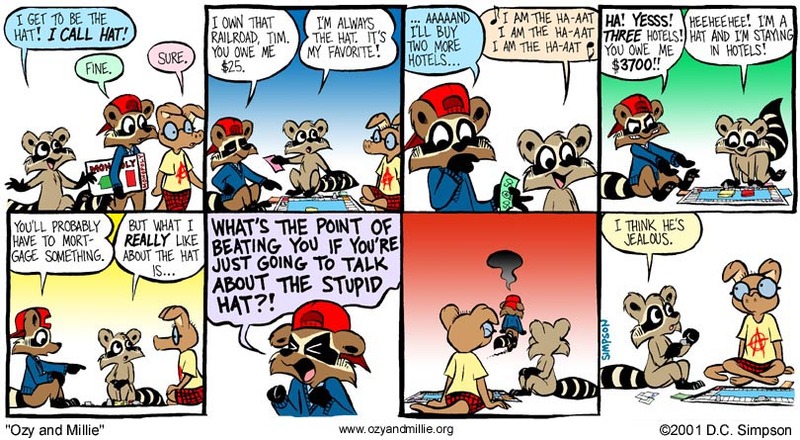 Actually, Timulty’s going on about the hat would get annoying after awhile.